Kelsey Vetter is a brand new breastfeeding mom to 13 week old twin girls in Mount Airy, North Carolina. While at work at Lone Star Steakhouse in Mount Airy, Kelsey takes a 20 minute break to pump milk for her hungry babies at home. Pumping for her little ones is something that is not only vital to their healthy beginning in life, but is also protected by law -- working mothers have the federally sanctioned right to take a break at work to pump milk. (See laws in detail below). However, one Lone Star customer who was sat in Kelsey's section on June 24, 2015, did not seem to understand the many reasons a young woman may need to step away from her tables for a brief time. This customer would likely benefit from learning a little more about who their server was that night --a working mom striving to do the best for her small babies. 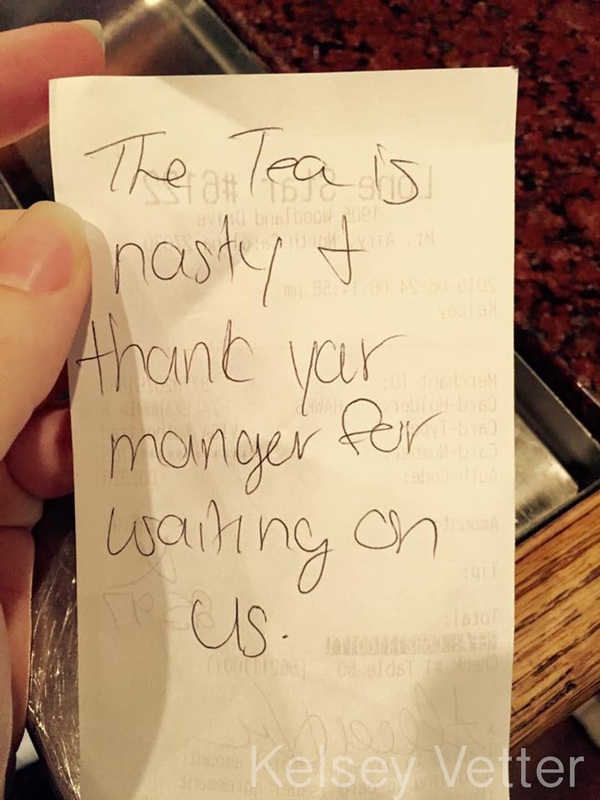 Instead of inquiring, or having compassion for what the situation may be, this customer left a large "X" scribbled where a tip would otherwise be written onto their receipt, and left nothing for Kelsey's time in waiting their table that night. In addition, on the back was a scribbled note (above). We would like to encourage Kelsey -- not only for standing up on behalf of thousands of other mothers who are working and pumping to balance mothering and paying bills, but also for her devotion to nursing her twins (and pumping for them when she's away). Any mom of multiples knows this is no small task, and Kelsey should be supported, encouraged, empowered -- not belittled and denied the income she works for. Photograph of Kelsey's twin baby girls from Heavenly Angels Photography. (r)(1) An employer shall provide— a reasonable break time for an employee to express breast milk for her nursing child for 1 year after the child’s birth each time such employee has need to express the milk; and a place, other than a bathroom, that is shielded from view and free from intrusion from coworkers and the public, which may be used by an employee to express breast milk.